JOAN HAUSRATH grew up in Ohio where she received an MFA in printmaking from Bowling Green (OH) State University and an MA in art history from Ohio State University. She is Professor Emeritus from Bridgewater State University in Massachusetts. Hausrath has shown her prints internationally in juried and invitational exhibitions. She creates her hand pulled prints by using recently developed materials and processes that are safer to use than those used in traditional printmaking. 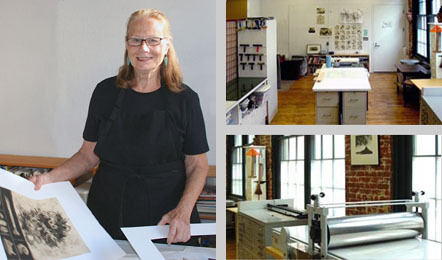 After retiring she relocated to Pawtucket, Rhode Island, where she maintains a print studio in a live/work loft. She is available to teach workshops in non-toxic and safer printmaking processes and to give lectures and demos.